What follows is a reformulated version of my Integral Ecology post, rewritten to conform to the changed terminology that I adopted in my post Metaphysical Ecology. I have substantially expanded on some of the ideas below in a further post, Ecological Temporality. .
Food webs are basic structures of ecology, with the latter understood in specifically biological sense. Since man does not live by bread alone, the bio-ecological structures of human experience involve more factors than the food web illustrated above. Firstly, I want to briefly consider what ecology has meant heretofore. What is ecology in its initially narrow meaning? What is ecology sensu stricto? There has been some lack of precision in the definition of ecology, so these definitions have lacked the formal exactitude that one might expect (or hope) from the biological sciences. Nevertheless, there have been enlightening even if not formal definitions of ecology. Another biologically specific conception of ecology. This definition is biologically specific and not anthropocentric, so the primary task of extending and expanding our conception of ecology is not one of disposing with anthropocentric prejudices but of formulating a definition of ecology that is not specifically biological. A generalization of ecological thinking to cosmology: galactic ecology. (1) Ecological science: the science concerned with the interactions of living organisms with each other and with their environment, also called bionomics. (2) A branch of biology that deals with the distribution, abundance and interactions of living organisms at the level of communities, populations, and ecosystems, as well as at the global scale. (2) The system within the environment as it relates to organisms living in it. (3) A branch of sociology that deals with the relations of human beings with their physical and social environment, also called as human ecology. This definition of ecology includes the extended sense of ecology employed by Urie Bronfrenbrenner, which we will consider in more detail below, because Bronfenbrenner’s ecological systems theory (sometimes called the bio-ecological model) represents an extant generalization of ecology. Haeckel was the one who introduced the concept of ecology, so his definition is of particular interest. While it is expressed in a nineteenth century idiom that is redolent of the idea of “Nature, red in tooth and claw” (as Tennyson saw it), Haeckel’s definition of ecology will prove suggestive in a formulation of battlespace in terms of metaphysical ecology. Although Haeckel’s intriguing definition of ecology was not Bronfenbrenner’s point of departure for a generalization of ecology, I mention it here because I will return to it below. In its most common signification, ecology is narrowly biological in conception. The reference to the inorganic context of life is there only because life always occurs in an inorganic context. Life is the focus. Bronfenbrenner’s exposition of bio-ecology, or ecological systems theory, represents a significant generalization of the concept of ecology, and this generalization requires that we arrive at an abstract conception of ecology in order to understand its relevance to non-specifically biological subject matter. What is the implied abstract conception of ecology? I call the implied conception metaphysical ecology. The extension of the idea of ecology already pursued to date has been formulated in the context of the fields of social work and psychotherapy by Urie Bronfenbrenner, especially in his book The Ecology of Human Development: Experiments by Nature and Design (Cambridge, MA., 1979). This is a systematic exposition of what he calls ecological systems theory, which systematically places individuals within progressively more comprehensive and inter-related social structures. ●The Micro-system: The setting in which the individual lives. 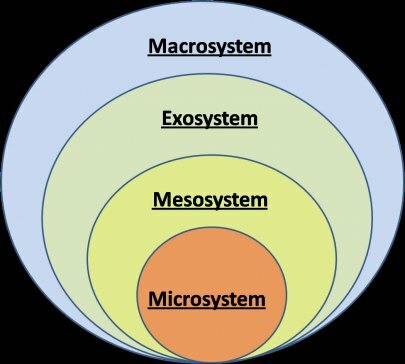 ●The Meso-system: Relations between microsystems or connections between contexts. ●The Exosystem: Links between a social setting in which the individual does not have an active role and the individual’s immediate context. ●The Macrosystem: The culture in which individuals live. ●The Chronosystem: The patterning of environmental events and transitions over the life course, as well as sociohistorical circumstances. ●Micro-temporality: The temporal setting in which the individual lives. ●Meso-temporality: Relations between micro-temporalities or connections between temporal contexts. ●Exo-temporality: Links between a temporal setting in which the individual does not have an active role and the individual’s immediate temporal context. ●Macro-temporality: The historical era in which individuals live. ●Metaphysical temporality: The whole of metaphysical history in which the individual temporalities are embedded. ●Metaphysical system (or Metaphysical Ecology): Ultimately, the metaphysical system as the furthest extrapolation of bio-ecology is co-extensive with metaphysical ecology. This is the master category and the most comprehensive form of bio-ecological thought, just as metaphysical history is the master category of history and the most comprehensive form of historical thought. 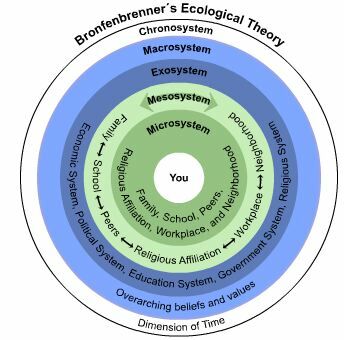 As I noted above, Bronfenbrenner does not take as his point of departure Haeckel’s definition of ecology as the science of the struggle for existence, and then proceed to extend and expand this definition. I would like to suggest re-thinking Bronfenbrenner’s bio-ecological systems theory in terms of Haeckel’s definition, because in this case bio-ecology becomes an extension and expansion of the struggle for existence. When we think of ecology from a point of view of its extrapolation to a completely comprehensive conception of metaphysical ecology, Haeckel’s definition remains valid — even at its most comprehensive level of metaphysical ecology, ecology is still about the struggle for existence — and so we see in retrospect that Haeckel himself had a highly abstract and comprehensive conception of ecology. This suggests the possibility of the application of integral of ecology to human struggles in the form of war. The earliest known battles of human history, which followed upon the emergence of settled agricultural societies, literally took place in open fields; there was, from the beginnings of conflict organized under the auspices of civilization, a field of battle, so that the term battlefield was literal. Over time, and with the increasing sophistication and complexity of civilization, battle also became more sophisticated and complex. 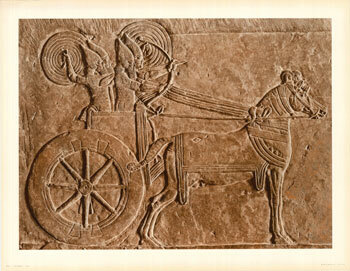 The war chariot was a game-changing weapons system of early human history, but optimal use of chariots required a flat and level battlefield. The chariot also experienced its optimal operations on flat, level ground, and while there was, as Dupuy notes, a social consensus to fight battles on wide, level fields — not unlike the parade ground upon which such soldiers would have been drilled — there were also instances in antiquity of armies denying flat, level ground to forces that required such conditions for optimal operationality. The perpetually open flank of a battle fought in wide and open country also established norms for the order of battle that were impracticable in forests, jungles, mountains, and other forms of difficult terrain that would figure more prominently in the later history of war. The efficacy of the phalanx formation in battle demanded a high degree of drill so that the whole column could move as one. This worked best on flat and level ground, making the battlefield (understood literally) its optimal theater of operations. When, after the Industrial Revolution, war was also industrialized, and the world experienced its first great industrialized war with the First World War (the “proof of concept” of industrialized war), battles could be fought for months at a time over multiple and distinct kinds of terrain, and could involve resources that had little to do with the literal physical space in which combat occurred (for example, with the introduction of radio, the electro-magnetic spectrum became increasingly important). In response to this growing complexity of the battlefield, contemporary theory of war employs formulations in terms of battlespace rather than battlefield. The formulation of the idea of battlespace is a conceptual innovation that reflects the systematic exploitation of the nexus of science and technology that characterizes institutions after the Industrial Revolution. A fully articulated doctrine of battlespace is a conceptual improvement over the continued use of “battlefield,” but can go beyond battlespace to the yet more comprehensive conception of battle ecology. We can employ the concepts of metaphysical ecology to bring more analytical clarity to the contemporary concept of battlespace. I suggest that the very idea of battlespace is unnecessarily limiting, not least because it is a spatial concept, and we can formulate a much more comprehensive concept. 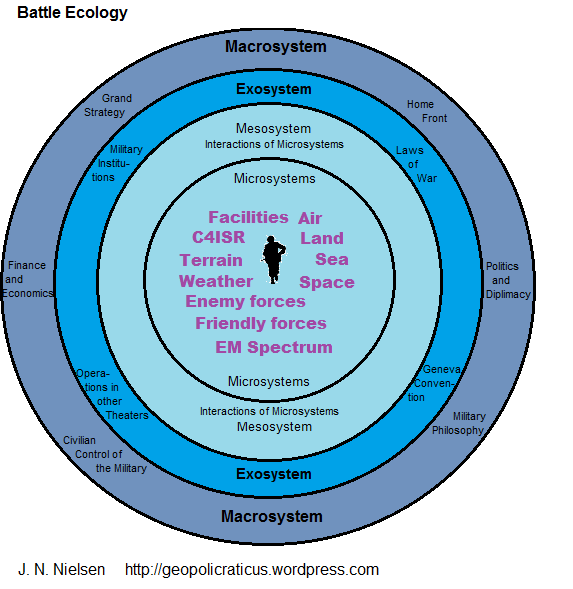 The metaphysical ecology surrogate for battlespace (or, rather, the more comprehensive conceptual infrastructure within which the concept of battlespace can be located) is what I will call battlespace ecology. The concept of battlespace and knowledge of the battlespace (which latter is the formal surrogate of the intuitive experience, i.e., the lived experience of the battlespace) as defined above is clearly a more comprehensive conception than the traditional concept of battlefield, yet its formulation in spatial terms implies conceptual limitations, even if we allow for abstract spaces such as intelligence and the electro-magnetic spectrum. The Marine Corps definition is admirably comprehensive, but it can be given further conceptual rigor and can be assimilated to a comprehensive conceptual infrastructure by placing battlespace within battle ecology. In battle ecology, the individual items mentioned in the definition — “air, land, sea, space, and enemy and friendly forces, infrastructure, weather, and terrain” — can be treated as concrete or abstract spaces that find their place within a comprehensive ecology. While the Marine Corps definition given above does allow that battlespace is not fixed and varies over time, the greater generality and comprehensivity of battle ecology systematically integrates the changing factors of the battlespace into the personal temporality of the soliders within the battlespace, the temporality of history in which these events are embedded, and all levels of temporality between subjective time-consciousness and objective history. This graphic focuses on the role of the individual soldier and his lived experience of battle. ●Micro-battlespace: The setting in which the individual solider fights. This is the point at which Clausewitz began: the duel. ●Meso-battlespace: Relations between micro-battlespaces or connections between battlespace contexts. ●Exo-battlespace: Links between battlespace settings in which the individual soldier does not have an active role (other theaters of operations) and the individual soldier’s immediate context. ●Macro-battlespace: The strategic and tactical culture in which individual soldiers fight. ●Metaphysical battlespace: Ultimately, the metaphysical battlespace is the furthest extrapolation of battlespace ecology. This is the master category and the most comprehensive form of military thought, just as metaphysical history is the master category of history and the most comprehensive form of historical thought. ●Exo-battlespace temporality: Links between temporal battlespace settings in which the individual soldier does not have an active combat role and the individual soldier’s immediate temporal battlespace context. ●Metaphysical temporality: The whole of metaphysical history in which the individual temporalities are embedded, which is not a specifically military concept (nor specifically strategic or diplomatic, etc. ), but which is the same metaphysical temporality I have been developing in several posts to this forum — i.e., the most comprehensive and abstract conception of time, beginning with the individual’s subjective time-consciousness, coincides with Metaphysical history. One important lesson of this last conception — that of metaphysical temporality as the ultimate setting of less comprehensive temporalities in which battlespace ecology is contextualized — is that any specific and particular conceptual inquiry, when pursued to the farthest reaches of abstraction, generality, and formality converges with other specific and particular inquiries that also have this purified conception as the natural teleology, if you will, of intellectual inquiry. The further lesson of this observation, in turn, is that all specific, particular, concrete, empirical, and peculiar conceptions ultimately have abstract and general ideas as the conceptual setting that gives them meaning. In other words, there is a conceptual ecology also that obeys many of the same principles of conceptual extrapolation as formulated above. 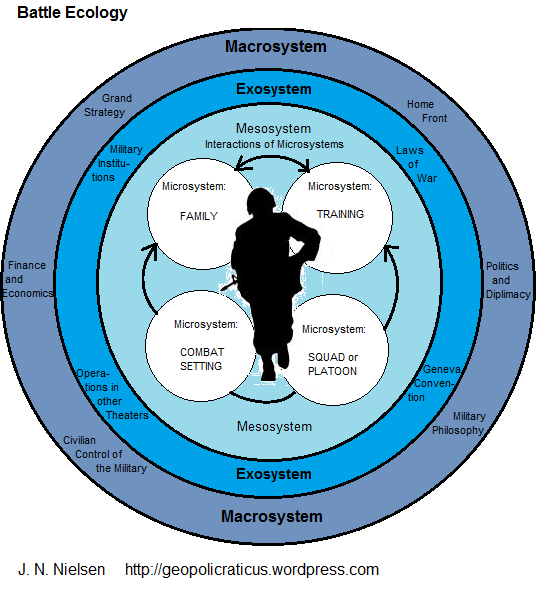 The distinct microsystems of battle ecology are interrelated at the level of the mesosystem; in traditional terminology, distinct tactical initiatives are unified within battle operations. One immediate benefit of formulating military campaigns in terms of metaphysical ecology is a clarification of the relative roles of tactics, operations, and strategy. Tactics always take place on the level of microsystems. Any particular operation is the coordination of relevant microsystems, so that the mesosystematic level of battle ecology could also be called the infra-operational level (or the intra-operational level). The relation between different operations takes place at the exosystematic level of battle ecology, so this could also be called the inter-operational level. Strategy takes place on the level of the macrosystem. Grand strategy involves the coordination of macrosystems specific to distinct areas of human endeavor, and its proper setting is integral history taken whole. 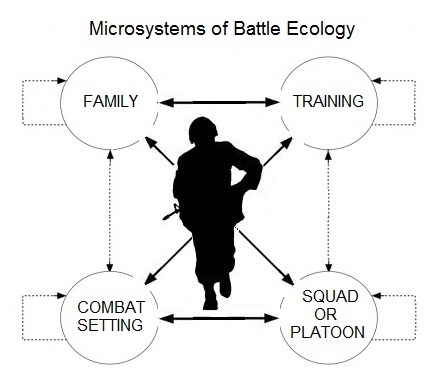 This diagram focuses on the micro-systems of battle ecology, which micro-systems are the abstract spaces of battlespace. ●Tactical Environment (the micro-battlespace): The setting in which the individual solider fights. This is the point at which Clausewitz began: the duel. ●Intra-Operational Environment (the meso-battlespace): Relations between micro-battlespace or connections between battlespace contexts. ●Inter-Operational Environment (the exo-battlespace): Links between battlespace settings in which the individual soldier does not have an active role (other theaters of operations) and the individual soldier’s immediate context. ●Strategic Environment (the macro-battlespace): The strategic and tactical culture in which individual soldiers fight. ●Grand Strategy (the metaphysical battlespace): Ultimately, the metaphysical battlespace is the furthest extrapolation of battlespace ecology. This is the master category and the most comprehensive form of military thought, just as metaphysical history is the master category of history and the most comprehensive form of historical thought. The idea of metaphysical ecology as here first formulated is, in virtue of its comprehensive definition, not specific to an exposition of battlespace ecology. Battle ecology is a special case of metaphysical ecology, just as the bio-ecology of individuals, families, and communities in their social setting (the occasion for Bronfenbrenner’s formulations of ecology in an extended sense) is also a special case of metaphysical ecology. Moreover, as both being special cases of metaphysical ecology, both battle ecology and bio-ecology find their place within the more comprehensive conceptual structure of metaphysical ecology. In other words, in Bronfenbrenner’s words, both are macrosystems that stand in relation to each other within metaphysical ecology. 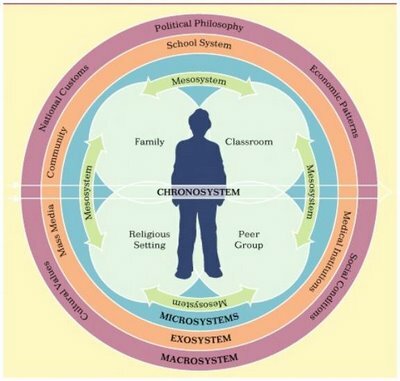 The 2nd graphic, Bronfenbrenner’s Ecological Systems, is referenced where? Where did you get this image? I remember seeing it in a Human Development text book, can’t remember which one. Can you provide a specific reference of the owner? This image is widely available on the internet, or, at least, it was when I wrote the above. I am sorry to say that I do not know its ultimate source. I know I have used this image before in Develop Course. I believe it was from the Life Span Development text by Laura Berk or the text by Kathleen Berger… not sure which edition. Thanks anyway, I will keep searching. Delighted to have stumbled upon your blog when looking for images on Bronfenbrenner, especially for the multiple peripheries as I required a nudge to see this logical step beyond the thinking of the likes of Seely Brown and Duguid. I’m writing up at 6000 assignment for the Open University Masters in Open and Distance Education – when that’s out the way I’ll come back to this as I am particularly taken by the way you are developing and visualising the way people learn. I’ve reached a stage where I want to develop my own theory of learning – at least I will think it is my own until it has been thoroughly referenced then I’ll see that I am drawing on all my favourites: Vygotsky, Seely Brown, Engestrom … Kolb et a;. I’m pleased you found something of value in my post. If you’re interested in Vygotsky, I hope that you’ve seen my post The Hierarchy of Perspective Taking, in which I adopt a much more developmental approach. I have come to realize that laying out the Bronfenbrenner hierarchy of ecological niches of the individual (or, at least, my own personal variant of this that distinguishes between spatial and temporal biosocial ecologies) is an essentially structuralist (or, if you prefer, synchronic) approach, while the developmental perspective constitutes a functionalist (or, again, if you like, a diachronic) approach. Ultimately, in order to understand the world, we need both the structural and the functional, the synchronic and diachronic, but lately I have been working more on the developmental side.